ProCombo-1 is a sleek keyboard and mouse combo that is completely wireless so you do not have to worry about the limitations wired keyboards and mouse bring. Simply plug in the Nano USB and start using it. The silent soft touch keys allow the user to type without the annoying key press sounds. The mouse has all the functions and shortcuts that you require while using your computer. The Auto-Sleep function puts the keyboard and mouse combo to sleep when not in use to save up on the battery. With a simple click, you can wake up the combo and continue using it. 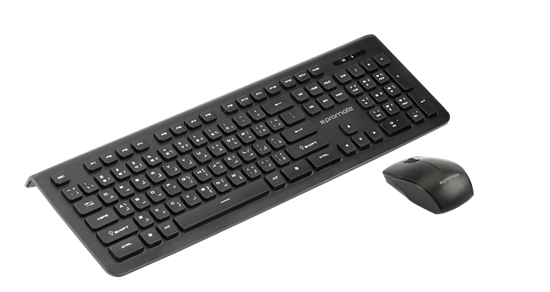 The KeyMate-3 Includes a minimalist Typewriter Styled keyboard and a precision mouse, so you can work comfortably away from your computer or laptop. Compatible with Windows and Mac OS. The well-spaced, low-profile keys allow quick and accurate movement, as well as making it easier to clean than most standard keyboards. Keys are quiet, quick, and responsive. Type naturally with the standard keyboard layout you're used to, including full-size F-keys and number pad. The wireless mouse features a soft and sturdy grip for precision controls. The proCombo-1 Keyboard comes with a classic floating-key design and brings the nostalgic feeling back. The eye-catching retro styled keyboard helps you type faster with better spaced and popped out keys. The biggest benefit of proCombo-1 is they are spill resistant to some extent with the popped-out keys and easy to clean. The proCombo-1 Keyboard comes with whisper quite keys which are soft and silent for a comfortable and feel-good typing experience. The keys are made low profile and silent which barely makes a sound so that you can work and type effortlessly without any disturbance. The proCombo-1 Keyboard is designed keeping in mind the comfort of the daily user and hence provide utmost comfort and easy for fast typing and mouse movement. The keyboard with the popped-out keys helps in better and fast typing with utmost accuracy, unlike clustered button keyboard. It provides easy access to all the keys without any strain. The wrist panel at the bottom provides more support for fast typing. The KeyMate-3 mouse has a soft and sturdy grip-pad which makes it easier and smooth to hold in the hand for precise and sensitive movements. 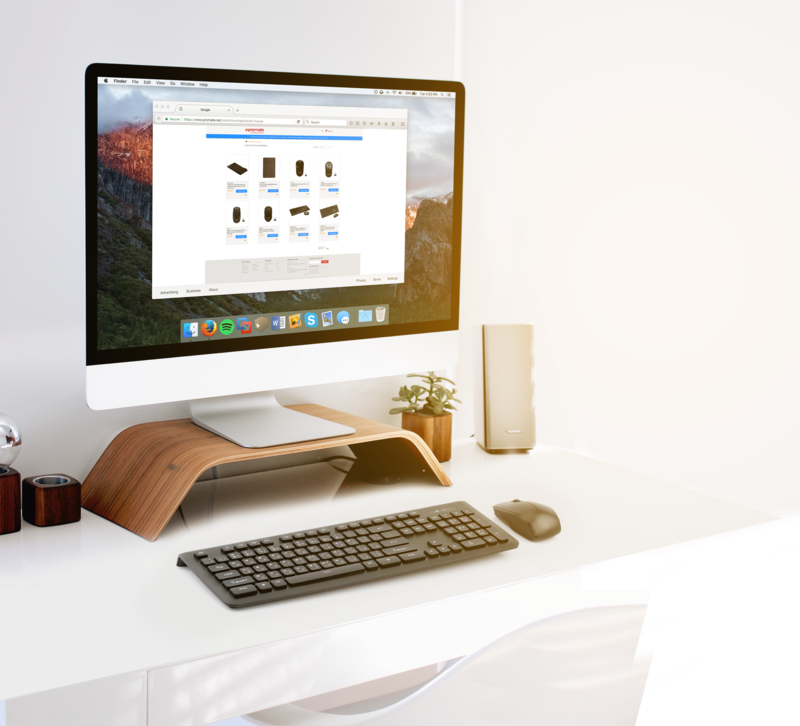 The Promate proCombo-1 Keyboard comes with an adjustable tilt leg which can be used to adjust the keyboard into angles suitable and comfortable for the user. Just adjust the legs on the bottom of the keyboard according to your comfort. The proCombo-1 Mouse comes with Optical Tracking Technology which provides more sensitivity than standard mouse and quicker response time, more precise movement and smoother tracking on a wide range of surface. Sensitive mouse clicks with Less Noise, and suit both ordinary and gaming needs. The proCombo-1 Keyboard comes with Bold, Bright characters which makes it easier to read. It is the perfect mate for senior citizens and can be even used to type under nightlamps with less visibility. This combo from Promate proCombo-1 comes complete with an incredibly compact and portable USB receiver. Simply connect the receiver to one of your PC or Desktop USB ports, and you'll be ready to start working, messaging your friends with increased ease or whatever else you need the keyboard to do. The proCombo-1 has a 2.4 GHz wireless connection which provides a powerful, reliable and stable connection up to 10m. Plug & Play. 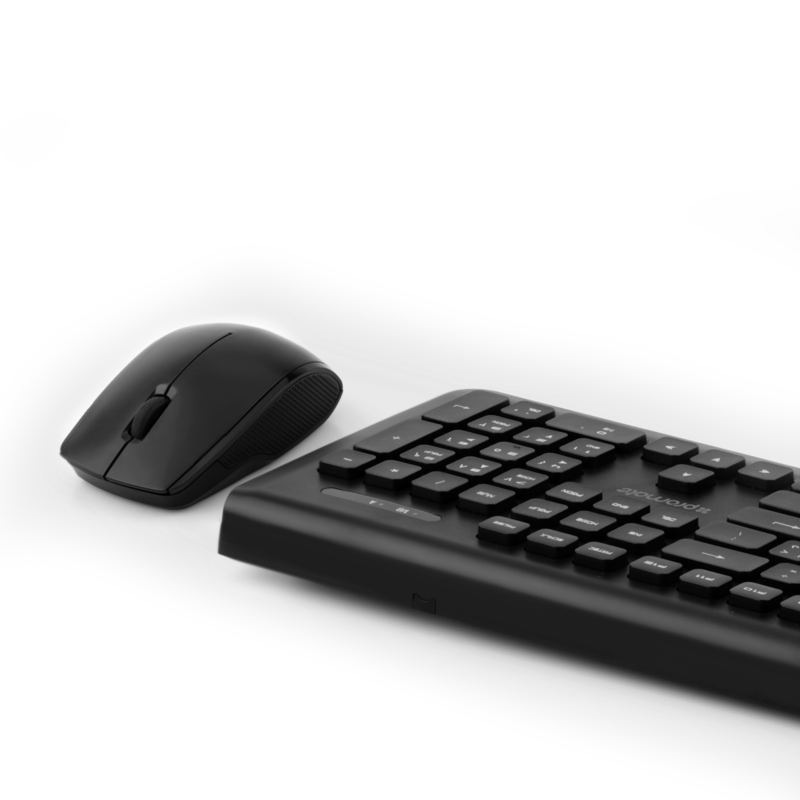 One small Nano receiver connects both the mouse and keyboard to your computer. Just plug it into a USB port and you’re ready to go wireless and without hassle.